NOTE: Your opinion is very important to us. Use tab “Comments” in top of the page to write your comment/review/feedback, if you have any experience with "GPS forex robot ! We don’t recommend this EA !!!! GPS forex robot (official website) is a forex trading robot which has been modified and refined in later versions, and today it claims to have a smoother profit curve, as well as some customizable features. It was developed by Mark Larsen and his team of programming experts. All in all, this forex robot does have something proprietary to it, as it senses more metrics in the market than just a simple moving average crossover, and a few momentum metrics. So it does have some proven profitability. This robot has managed to do fairly well in actual trading tests, and has shown enduring profitability, with an average drawdown of around 12%, when markets trade smoothly. And the ratio of winning to losing trades is actually 90 to 10 or so, but certainly not 98 to 2 as the creators claim. GPS forex robot has proven to create large amounts of profits, over several months, in the range of 10s of $1,000s, at various times, when things are relatively smooth and a large enough trading account is used. There is definitely some work and effort that has been put in the design of the Expert Advisor this robot uses. The reality however is that it has also ruined many small accounts, usually under $1,000 accounts, where the users thought they would achieve just as good results. Not exact trading settings are known for these accounts, but they probably failed because these users failed to understand certain risks. So, there is an element of irony here, how can the software that generates $100k in one account, over several months, end up blowing some other smaller accounts? It all comes down to money management, rather than account size. Forex robot users need to understand that even automated trading software is not really fully automated, they still need to spend some time watching the market charts, and the volatility over the next 10 – 20 days. Only after the volatility has been assessed, they should enable the robots to trade their accounts. Under smooth volatility conditions, the GPS FX robot can indeed generate effortless profits day after day. Actual expected drawdown is usually up to 12%, and in adverse cases up to 20%, but the robot still manages to trade profitably, albeit doing so at much higher risk. So the lower the drawdown, the better, even if profitability is less. There is an element of risk here, since the creators argue that there is no Martingale strategy involved in the software, but as you can clearly see the GPS forex robot uses a strategy known as Stop and Reverse. If a losing trade occurs, the software senses the criteria for opening a much larger trade in the opposite direction. As you can see on the above actual MT4 statement, the hedging trade is 7 times larger in size than the losing trade, that is classic Martingale strategy ;-(. So in reality there is risk involved, that is risk of unforeseen volatility which could trick the software into a series of losing trades, which would end up blowing even a very large trading account completely. Market volatility is a big risk for all investors and traders, at all time frames. Unforeseen volatility can ruin even the largest trading accounts, because there is no easy way for implementing money management. Traders use a certain money management technique, but volatility can still trick the trader or the automated software, into making trades where the market fails to move enough in one direction, or where too much confusion is created. Users need to pay attention to their market charts, and volatility especially. 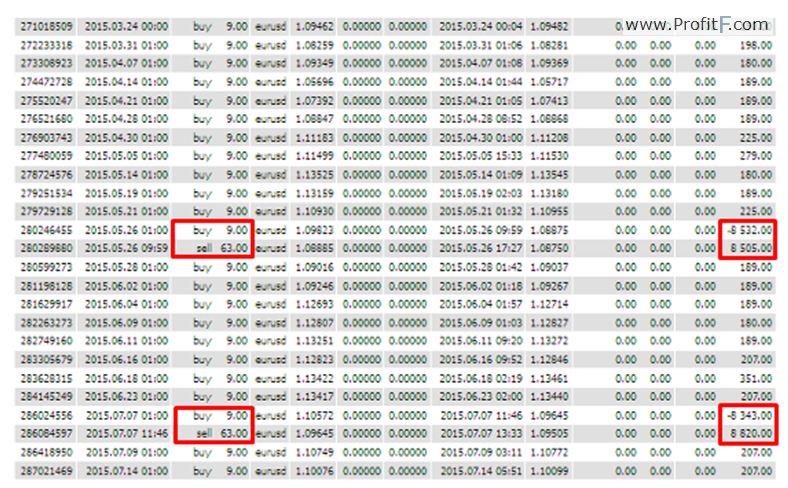 GPS forex robot is capable of blowing even a very large account. The fact that small accounts were blown but other large accounts made big profits using this product, is more down to the careful meticulous use of the large account users, in regards to volatility and settings, and not down to account size. It does use a Martingale kind of strategy, which is why the robot is capable of recovering big losses, and it does it successfully most of the time, but not 100% of the time. There are times where it can fail catastrophically if weird volatility phenomena take place, which could trigger one losing trade after another, increasing the trading size each time, thereby blowing the account. It is similar to arguing how big airliners fly, they do use a great deal of automation software, but even this automation is not enough to get you from A to B 100% safely. If the airliner encounters some weird turbulence there is a remote but still existing possibility, that it will crash. As the turbulence can fool the software, under certain conditions, and make it do all the wrong things. Which is why despite all automation, pilots are still in charge of all flights. It’s the same with this software that the GPS forex robot uses, users need to use careful settings, opt for the settings that offer the lowest drawdown, at even the lowest profitability, and of course pay attention to volatility forecasts over the next 10 to 20 days. Dealing with volatility and being well prepared for volatility changes, will help remove most of the hidden risks, and will ensure realistic, profitable results all year round.